Liquid Blu 5 Speed Blender - Black. Soft blue light gently illuminates your counter. 5 speed illuminated touchpad controls. Scratch-resistant acrylic shell maintains its luster. 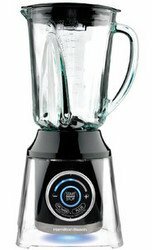 Price $70 Based on the manufacturer's suggested retail price (MSRP), this blender is PRICED ABOUT AVERAGE when compared to all other blenders. Watts The BL10450H is MORE POWERFUL THAN AVERAGE and ranks in the TOP 16% of all blenders. Stars Based on actual user experience and reviews, this blender is RATED LOWER THAN AVERAGE by 32 USERS and ranks in the BOTTOM 15% of all blenders. 39% of users rate this blender favorably. It is a cool looking blender and the night light aspect is neat too. That said, it leaks from the bottom. I have had mine over 2 months and use it daily for smoothies and it works like a dream. any negative reviews from others I would attribute to operator error. I will admit I love that it glows and it is a gorgeous blender all together. However, it won't last very long. Within a month it stopped working completely. This machine bogs down at the slightest resistance, such as bananas, and ice nearly stalls it. It worked like a champ for about four months - and then just died. I called Hamilton Beach and they sent a replacement. It too died after four months!